Reducing the number of related party transactions and aligning pay for performance. 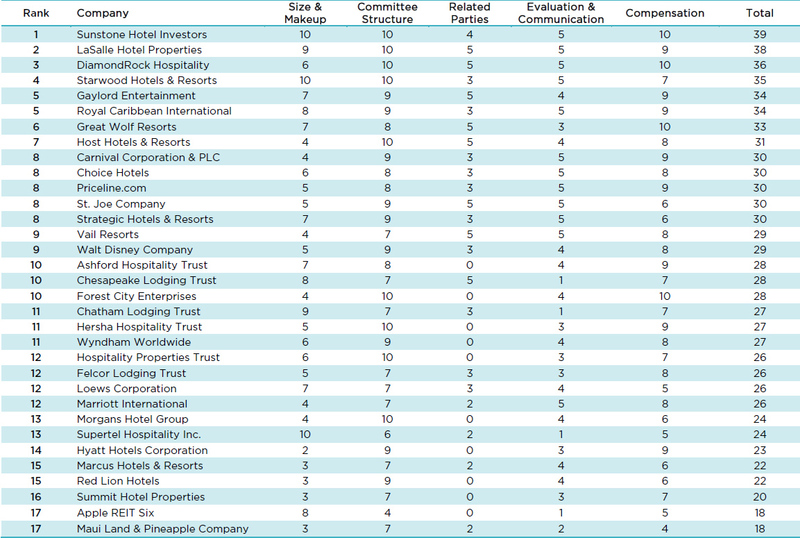 Each year, we recognize a US board that is most effective in leading a public hotel company. Using a proprietary corporate governance model we tabulate rankings that compare board makeup, independence, committee structure, conflicts of interest and a commitment to pay-for-performance. 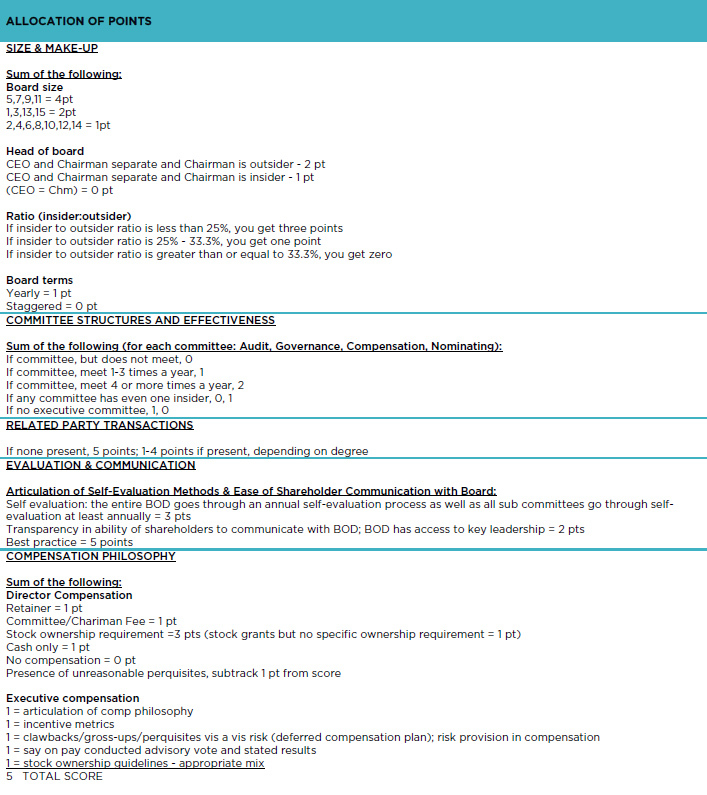 Boards have done such a good job implementing best practices in these areas that, this year, in an effort to raise the bar we felt it necessary to modify some of our evaluation criteria to include: board self evaluation and communication, tighter evaluation parameters for both board and NEO (Named Executive Officer) compensation that takes into consideration shareholder “say on pay” votes, implementation of claw backs and stock ownership requirements, elimination of excise tax gross-ups and purging of excessive perquisites. We hope that the addition of these new criteria will support public hotel boards in their pursuit of continuous improvement. For next year’s study, board diversity will be added to the evaluation criteria. We were interested to see what would emerge after the passing of the Dodd-Frank “Say on Pay” legislation. Many companies received very high marks (in the 90s) on their executive compensation plans from shareholders. A few received quite low marks (in the 50s), mostly due to the influence of watchdog organizations such as ISS. It’s been a refreshing and encouraging year in corporate governance and with the tentative turn of the economic tide, light is appearing at the end of the tunnel. Pay-for-Performance models for board and executive pay. Please see here for details on the allocation of points. Download the above table here. In this year’s study, director independence continued to inch upward with 11 companies having independent outsiders for their Chairman (vs. 10 companies last year) and 16 having appointed lead independent directors (vs. 14 last year). There was a slight decrease in the number of companies with overall best practice board structure from five to four. Best practice board structure is when the board has an odd number of directors between 5 and 11, the chairman is an independent outsider and more that 75% of the board is made up of truly independent directors. While SEC rules dictate that a company insider is considered “independent” after three years of separation from the company, we still consider that individual to have a great impact on the company. Boards of Directors are required by the SEC to form the following four committees: Audit, Compensation, Governance and Nominating. Identical to last year’s study, nine out of 33 companies achieved perfect scores in committee structure. However, we noticed that, on average, nominating and governance committees met with over 20% more frequency than in the 2010 analysis. Audit committee meetings were up slightly and compensation committee meetings were virtually unchanged. Insider participation on subcommittees of the board is practically non-existent today. Although the presence of related transactions has increased this year relative to last, this is not indicative of poorer practices, but rather a more stringent rating system. While twelve companies demonstrated complete absence of related transactions last year, that number has declined to only eight on this year’s scale; the new criteria will hopefully encourage enhanced governance practices. We hope that the companies will identify this need for continuous improvement and look to strengthen their policies in the coming years. How effectively a board operates internally, including self-evaluation and accessibility to shareholders can be indicative of high quality governance practices. Over 75% of the companies received perfect scores in either self-evaluation or shareholder communication, with twelve companies achieving a perfect mark. Although this category is new to the analysis this year, we believe that such internal reviews and communication generate better overall external practices. Since, over the past several years, a greater number of companies have adopted or increased stock ownership guidelines and worked with outside advisors to better align long-term incentives, we have implemented a more specific rating system to raise the bar in measurement. Four companies achieved perfect scores in pay-for-performance this year, one less than in the previous year. However, overall achievement did not decrease, but rather a perfect score for executive compensation required consideration of more components, including clear articulation of compensation philosophy and incentives, articulation of a claw back policy, and absence of excise tax gross-ups and excessive perquisites. While it may have been more difficult to wholly comply with all the measures, on average scores remained about the same. We believe that the tightened examination of executive pay will further encourage companies to implement quality pay-for-performance practices. With new performance measures and expectations, average total scores dropped a slightly, yet such results provide encouragement to strive for continuous progress. Many improvements were made this year, such as increased director independence and implementation of claw back practices which serve to better protect shareholders. As the standards continue to be raised, we have high expectations for the years to come. Sunstone’s jump to first place in this year’s analysis demonstrates the open field for improvement. We applaud Keith Locker, Sunstone’s Chairman, as well as its entire Board of Directors, for thoughtfully and carefully re-crafting its governance strategies and policies to achieve a benchmark level of excellence. Copyright 2017 Core 7 Consulting Group LLC. All Rights Reserved.